IMPHAL | Jul 8 : Directorate of Information and Public Relation (DIPR), government of Manipur organised a three-day expedition starting from July 4 to explore ‘Tuilha Kol’ waterfalls located at Chalwa village in Kangpokpi district. 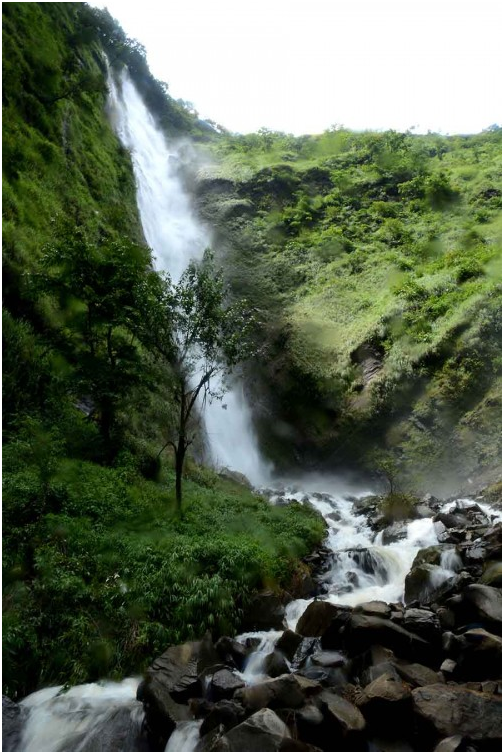 The expedition was organised with an objective to explore and document the waterfalls situated in hill top at Chalwa, a village along IT Road under Kangpokpi district. The literal meaning of the place is ‘Tuilha’ which means waterfall and ‘Kol’ which means hill or mountain. This enchanting hill ranges have three waterfalls which are the main source of river water. To reach the waterfall, the team passed through rough terrain and a dense forest area. The people of Chawla village are blessed with nature’s bounty. The small village with 250 households is the abode of TuilhaKol. There are nearly 30 villages surrounding the waterfalls which measures approximately 400 feet high. To reach the waterfalls, one has to cross two hill ranges. The team came across a place where stones were piled up around the tress. The villagers informed that it was created by their forefathers during British rule. According to the villagers, the stones were laid for resting purpose to further advent the tracking by the forefathers. During the expedition, the DIPR team met the villagers and they have expressed their strong desire to take up developmental programmes like better connectivity with district headquarter by the state government. They also appealed for setting up one veterinary centre as their main economy depends on cattle rearing and one health sub-centre as a priority. They also expressed their gratitude to minister of Tribal Affairs and Hill Areas, N. Kayishii and minister of Youth Affairs and Sports, Letpao Haokip for their visit and their assurance to look into the village issues. The villagers further expressed their strong concern for developing Tuilha Kol waterfalls as a tourist destination.